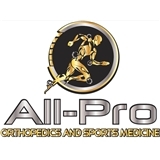 All-Pro Orthopedics and Sports Medicine. P.A. (Pembroke Pines) - Book Appointment Online! All-Pro Orthopedics and Sports Medicine. P.A. Catering to patients and athletes of all ages, All-Pro provides fisrt class treatment in a newly renovated office with state-of-the-art equipment, Electronic Medical Records, and Digital X-Ray.Dr. Shaw uses the most advanced orthopedic care with minimally invasive techniques including arthroscopy and other surgical procedures for a faster complete recovery. The philosphy behind ALL-Pro Orthopedics and Sports Medicine is to take the time to properly diagnose patients and then ensure the patient understands their specific condition, as well as ALL of the treatments available to them including non-surgical and surgical treatments leading to a complete recovery.